Today started off badly, but rapidly improved. And now, I think I can say that it's finished on a real high note. My sister phoned: she'd been travelling round the world with her husband since Christmas, but had come home early. The reason for cutting short her tour: she's expecting her first child! So, if all goes well, some time in the New Year I will be an "Auntie" My mother then admonished me to behave like a real auntie, and not like her sister. I was forced to point out that her sister was only 7 years older than me, so it was hardly her fault if she didn't behave in a very "aunt-like" fashion... and being in a different country also puts a bit of a crimp in aunt-visitations. There is just one little cloud: my sister has been experiencing some complications and bleeding, so as the "church-goer" I've been assigned the task of getting some serious praying done. Working on the principle that you can never have too many prayers said for you, I'll ask for as many as possible. O great Saint Gerard, beloved servant of Jesus Christ, perfect imitator of your meek and humble Saviour, and devoted child of the Mother of God, enkindle within my heart one spark of that heavenly fire of charity which glowed in your heart and made you an angel of love. O glorious Saint Gerard, because when falsely accused of crime, you did bear, like your Divine Master, without murmur or complaint, the calumnies of wicked men, you have been raised up by God as the patron and protector of expectant mothers. Preserve them from danger and from the excessive pains accompanying childbirth, and shield the children which they now carry, that they may see the light of day and receive the purifying and life-giving waters of baptism through Jesus Christ our Lord. I've been asked by my Parish Priest to help prepare a couple of boys for their First Holy Communion. I think the usual suspect was too busy, or was able to think on her feet a little more quickly than me: I was nabbed after evening Mass just over a week ago, and my mouth said "yes" before my brain kicked in. The first session was to have been last Tuesday: on hearing that there was some sort of football event on, I decided that it might not be the best time to dicuss the finer points of our Faith. So this evening I waited for the two boys to arrive for our first class. We then spent some time in the Sacristy learning how to make the Sign of the Cross with reverence; this led to some interesting questions on the nature of the Trinity. Finally the elder brother appeared to have cracked it. "It's like that CD" (he did mention the name of the singer, but I didn't quite catch it) "you know... you open up the box, and there are three CDs inside..." Not quite the accepted theological terminology, but I've heard a lot worse! We also amused ourselves by looking at vestments and the sacred vessels used for Mass: being an assistant sacristan has its advantages. The gold cope attracted most attention, especially when they got to hold it: "wow, it's well heavy!" There was also much speculation as to how much all those things must have cost. I think the greatest compliment came at the end: when I announced that the lesson was over, the boys were shocked - the time had gone so quickly. I just hope next week doesn't clash with the football! Sure enough, everything seemed to conspire against me: tights, contact lenses, traffic... To make matters worse, I just couldn't seem to settle down to any of the (boring) paperwork sitting on my desk. We have a custom at my school: whenever anyone has a birthday (or other significant celebration) that person provides chocolates, doughnuts, cakes or some little treat for the rest of the staffroom. Occasionally someone will just go for it because there is the consensus that we need cheering up. Tomorrow is my birthday, and because I wasn't in the mood to shuffle paper (Year 13 have left, so I have a little free time) I started to discuss the relative merits of chocolates vs. doughnuts as a birthday staffroom treat with another teacher. We came to the conclusion that supermarket doughnuts just don't cut the mustard. Fresh, hot Krispy Kreme donuts, on the other hand, were the business. 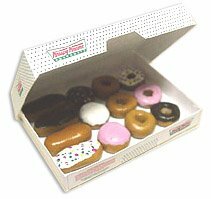 Unfortunately, I opined, Krispy Kreme at Bluewater don't open before we start school. Buying doughnuts the night before was fraught with difficulties, assuming that they survived the journey home (unlikely) but tomorrow is a full teaching day for me, and there wouldn't be any opportunities for scooting out in search of fresh doughnuts... I resigned myself to the idea of a large box of Celebrations. ...I shall draw a discreet veil over the details of who had how many and what variety. Such a shame that birthdays only happen once a year!